Starring Cynthia Rothrock as Nurse Carlotti. The battle rages on in space, and while the Starfleet ships get some good shots in they’re getting torn apart by the Chakuun “ghostships”. On the surface, Carlotti goes after a crashed pod and finds an injured Chakuun. While her first thought is revenge her instincts as a nurse takes over and she ends up treating her instead. Carlotti learns that the Thollians have a different understanding of territory, a more fluid-based perspective based on the shifting of the stars and planets, while Carlotti may have taught her that humans aren’t a bunch of savage children (you may want to tell Q that), and the Chakuun leave them be, both a little bit wiser about the other side. What they got right: Sometimes what requires the greatest strength is to live by your principles. Carlotti’s value of life, even an enemy, allows reason to save the day when brute force wasn’t working out. And yet we still get some good space battles. Now Carlotti can start letting go of all that hatred she’s had for years concerning her family’s death. What they got wrong: During the middle of a space battle is when Mia finally accept Joey’s date request after shooting him down during the business with the Doctor that wasn’t as serious. Mohindas is right, she does pick some odd times for romance. The sad thing is I see a future for these two. A rather odd future. Recommendation: A great two-part story. Highly recommended for Star Trek fans especially but still recommended others. 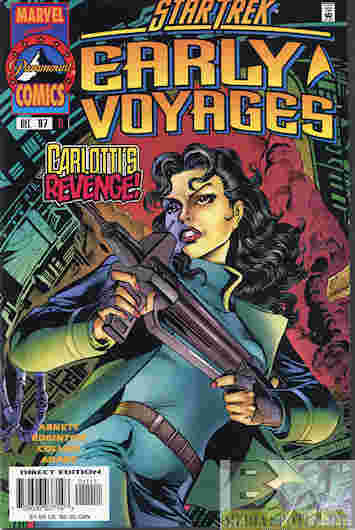 Posted by ShadowWing Tronix on April 3, 2019 in Television Spotlight, Yesterday's Comics and tagged Chakuun, Nurse Gabrielle Carlotti, Paramount Comics, Star Trek: Early Voyages, Tholians.